All clarinettists and many music-lovers know the two sonatas for clarinet and piano by Brahms. How many, even of clarinettists, know Reger’s three? Yet they are fine works, even if not quite on Brahms’ level, and well worth getting to know. Indeed, it was hearing one of the Brahms Op. 120 sonatas that decided Reger to write two of his own. His two Op. 49 works were written in 1900 though the second was not premiered until 1904. They both owe a considerable debt to Brahms, in their contrapuntal writing, intricately worked textures and elaborate piano parts above which the clarinet often soars. The first sonata opens dreamily, like the Brahms E flat Op. 120 No. 2, though it becomes more energetic later. The scherzo is light-hearted and the slow movement lyrical and very attractive. The finale features a helter-skelter main theme with quieter interludes. The second sonata has a troubled, chromatic opening, which seems closer to Brahms’ D minor violin sonata Op. 108. The second movement is also strange but in a different way: it is spiky and dissonant, seeming to anticipate Prokofiev, not something one expects to say about Reger. In contrast, the third movement is very gentle and the finale a dialogue between the two instruments. I find this the finer of the Op. 49 sonatas. The Op. 107 sonata followed in 1908. 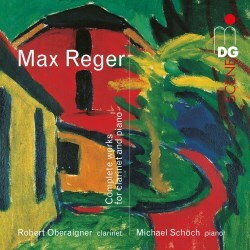 Reger had decided to make it ‘an immensely clear work’. It is less intricately worked than either of the Op .49 pair and so easier to follow, even though it is half as long again as either of them. In this work the moods change more quickly and the emotional range is greater. The scherzo is playful and the slow movement sombre. The finale, like the opening movement is mercurial. This work is more cheerful than the other two, also perhaps more distinctively Regerian. The disc is completed with two short salon pieces: the Tarantella is a skittish number while the Albumblatt is songlike, with a long line on the clarinet spun over a rocking accompaniment. The two players are Austrians. The clarinettist Robert Oberaigner is now solo clarinet with the Staatskapelle Dresden. He plays a German-style clarinet. This has a longer cylindrical portion of the bore than the French instrument which is more common in the rest of the musical world. The key work is different too, which changes the character of some notes. The result is a wonderfully rich and creamy sound, in contrast to the perkier character of the French model. This was obviously the kind of instrument Reger expected and it is a real pleasure to hear his music played so idiomatically on it. The difference comes out most clearly in Op. 49 No. 2, which is written for clarinet in A, unlike the other works which are for clarinet in B flat. The pianist Michael Schöch copes fluently with Reger’s often very elaborate piano parts. MDG are very experienced in recording chamber music. They have chosen here to balance the clarinet a rather forward position, which is necessary for it to sound well against the often very full piano writing. The disc is a SACD but I listened in conventional two channel stereo. The booklet notes give the background but say almost nothing about Op. 49 No.2. There are several other recordings of the clarinet sonatas, but few of them also include the two short salon pieces. On the bargain shelf Claudio Conti and Roberta Bambace have the same programme on Brilliant Classics, but Stuart Sillitoe considered them let down by their recording (review) and preferred Janet Hilton and Jakob Fichert on Naxos (8.572173). Gavin Dixon had reservations about Florent Héau and Patrick Zygmanowski (review) and in any case they provide only the two Op. 49 sonatas. Ib Hausmann and Nina Tichman offer the whole of this programme and indeed an extra work, a Romance in G which was originally written for the violin. Colin Clarke really liked this (review) and it is probably the main competitor for the present disc. However, on its own terms this is a rewarding recital and well worth considering.